This study delves into a matter that could be considered in a political light: which stratum of homeowners has profited the most from home ownership in the past 28 years? The purpose of this study is not to be political. It is simply to set forth facts. The inflation-adjusted trend can be seen in this chart. The bottom line is this. 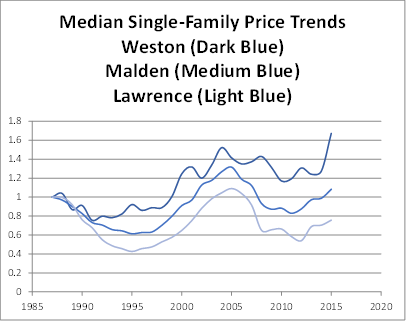 Without inflation, a dollar invested in a Weston house in 1987 grew in value to $1.67. A dollar invested in a Lawrence house declined to $.76. Without being political, we can say this: as with other measures, such as measures of income, for the past 28 years, the gap in the value of this asset, the single-family house, has widened between the high end and the rest. What does this mean for commercial property valuation? It means that appraisers should be aware of the demographics of the communities where they make appraisals. We make appraisals of buildings. But what is happening to the people in the buildings is important to building valuation as well. What is well known is that gains in income over the past 30 years have gone more to high-income people than to low-income people. How that translates into an effect on property values isn't known until we make a study like the one presented here. As we might have expected, house prices for people at the high end have gone up much more than have house prices for people at the low end. It is not enough for an appraiser to know that incomes and prices for real estate have gone up at a particular rate for an entire metropolitan area. It is important to know the demographic trends community by community. The income trend for a community is likely to translate into a price trend for various types of real estate in that community - houses, apartments, and even retail.